I love the play of smoky chipotle with sweet potato — these are flavors that are meant to be together! If you aren’t a fan of the smoky heat from these chilis you can leave them out of the recipe and it will still taste yummy! Creamy, crunchy, smoky, sweet and DELICIOUS! This recipe is inspired by a chicken and rice burrito recipe I read awhile back in Food Network Magazine. Poke the sweet potato all over with the tines of a fork. Microwave until tender. Scoop out the flesh and mash. Season with salt and pepper. If you prefer not to use a microwave, preheat oven to 400 and bake sweet potatoes until tender about 1 hour. While the sweet potato is cooking, heat a non-stick skillet and heat salsa and chipotle until sputtering. Stir in beans and cook until warmed and a little bit thickened. Stir in cilantro and taste — adjust seasonings. Heat tortillas according to package instructions. Smear 1/4 of the sweet potato across the bottom half of a tortilla. Spoon 1/4 of the bean mixture and the cabbage over along with 1/4 of the cheese. 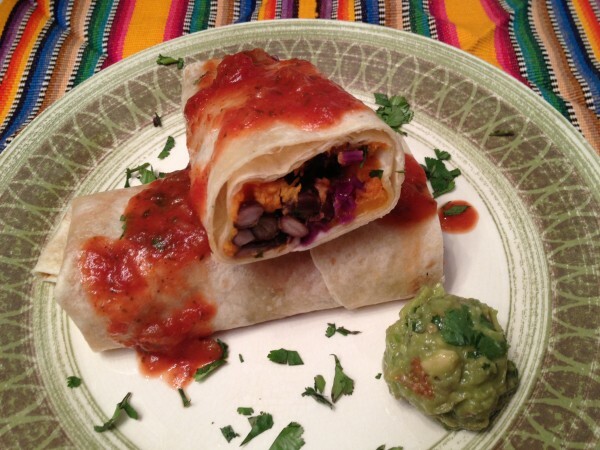 Roll up the burrito, tucking in the ends and serve with salsa and guacamole.